The project that will never end! I feel like the office/studio renovation is the Energizer Bunny and it keeps going and going...ugh! I know you all have to be tired of hearing about it, but it is pretty much all I am doing. I still have not painted the bathroom or finished organizing all the papers that are in random stacks in drawers. I made need a group for my stacking issues. Hopefully it will all be organized after it all done. If not than I really do need a group. I swear they should have a class in school that focuses on how to be organized. I know everyone does things differently so they should teach mutilple ways...ok, I will stop boring you with my issues with self discipline. I hadn't planned on cooking dinner tonight, but I ended up doing it anyway. I cooked a massive amount of navy beans. Don't know why, but I have neglected this particular bean. I feel bad for the white bean. I will definitely make it more often since I cooked 7 cups of them and there is maybe 1 cup left. Good thing the boys all love beans since it will be all I can afford if they are going to eat like that. I swear I fed them for two hours straight tonight! This is a BBQ Stuffed Eggplant! 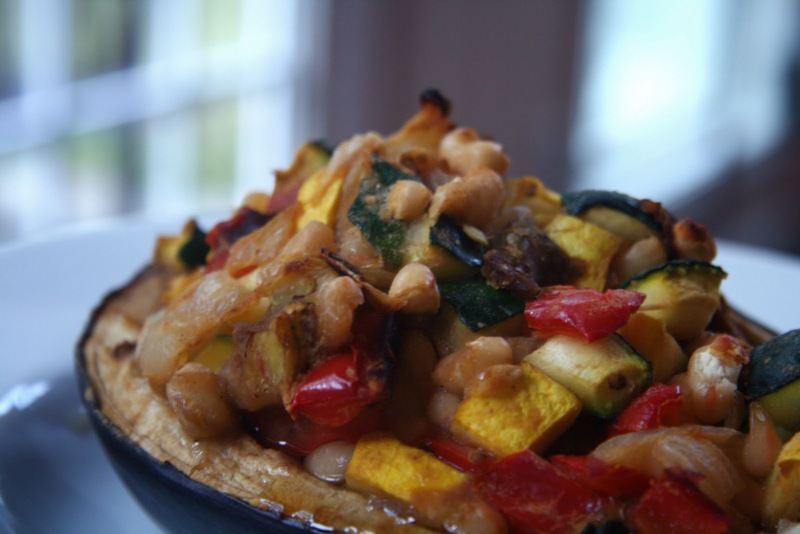 I will share the recipe tomorrow since it is now time to play some scrabble and watch some must see tv! I have to admit that I was a bit skeptical over how this would turn out. Not only was it delicious, but the illustrator tasted it after he started eating his meal (basically a deconstructed version of this without eggplant) and said he wished he was eating this! I was never a huge fan of eggplant, but it has grown on me. Is there something you didn't really like before, but have discovered you like it now? I'm the same way with eggplant-- I used to dislike it, but now I love it! Ugh-- I feel you on the neverending project-- I hope you can wrap it up soon! Can't wait for th BBQ eggplant recipe!! Sounds very good, and illustrator-approved, even! :P Funny you mention neglecting white beans - I do, too! Don't know why because they're so good, but I just grab black beans, I guess. There are more things i used to hate that I love now than I can count on my hands and feet. Pretty much any veg other than peas and potatoes, for starters! Scrabble!! How fun!! :) Yall are SUCH an adorable and sweet family, love it!!!!!! 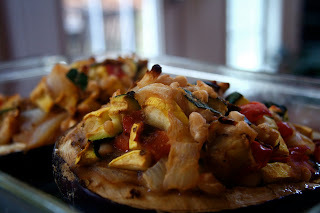 BBQ stuffed eggplant?! Your recipes always make my mouth water, this sounds so good!!! i used to despise onions and mushrooms. i like onions now if they are really really cooked. mushrooms, same thing. but i HATE the big ones. they scare me. That looks insanely delicious. I'm coming to your place for dinner tomorrow! Oh girl I totally understand about the never-ending projects. Let's just say my house was built in 1890 if that tells you anything. Can't wait to see the eggplant recipe. I prefer Japanese eggplants - they tend to be more tender and a bit sweeter. It's eggplant for me as well. I used to hate it and now, I think it's okay. I like eggplant, but it is definitely not my favourite veggie. I need to try cooking it in more different ways. I used to hate olives, shrimp, and wine, and have acquired a taste for each of those. I've only tried eggplant once but I really liked it! I didn't understand why everyone kept giving it such a bad rep.
A food that I use to dislike but now love? Sweet potato! Just a few months ago I could only stomach a couple bites. Now? Now I eat 1-2 every.single.day. Officially obsessed. 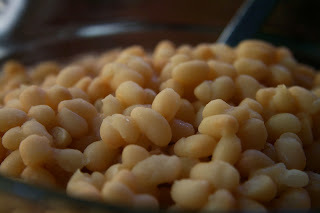 Yum - I love navy beans. My mom makes an amazing navy bean soup. :) Your stuffed eggplant sounds awesome. I love the addition of bbq sauce. Dinner looks great! Growing boys eat a ton of food! My Mother in law told me when my husband and his brother were growing up -- they would eat EVERYTHING. 1 pizza each and ridiculous amounts of sandwiches. I love eggplant. I've never had it stuffed. Looking forward to your recipe! I love eggplant. I wouldn't have thought bbq and eggplant would be good together, looks like a great meal! Can't wait for that recipe! I love BBQ on anything. Just wanted to say hi and thank you always for your kind comments! Apparently your taste buds change every 7 years! I randomly started loving avocado, asparagus, and sweet potatoes recently. Go figure.